Veteran's Day (Remembrance Day in Canada) is a day set aside to honor the men and women who have served in the military. From parents and grandparents to friends and neighbors, we have all been touched by those who serve. Over the years, there have been several professional athletes in the military. Several athletes who have served have been honored on trading cards. In 2007, Topps dedicated an insert set to athletes in the military. Distinguished Service is a 30-card set that was spread across 2007 Topps Series 1 Baseball and 2007 Topps Series 2 Baseball. Inserted 1:12 hobby packs, it's an inexpensive set that pictures many athletes in the military uniforms. Five autographed versions from Bobby Doerr, Bob Feller, Duke Snider, Monte Irvin and Ralph Kiner were inserted 1:20,000 packs. Additional cards honoring athletes in the military include 2009 Topps American Heritage Heroes, 2011 TriStar OBAK Baseball and 2011 TriStar OBAK Football. Yogi Berra is unquestionably one of sport's greatest all-time personalities. Always dependable for a classic piece of wisdom, Berra is a Hall of Famer with ten World Series rings. The catcher was a 15-time All-Star and three-time American League MVP. During WWII, Berra was a member of the U.S. Navy. He served as a gunner's mate on D-Day. 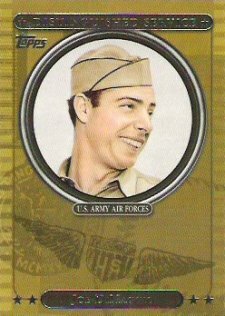 Another of baseball's legends, Joe DiMaggio reached the rank of Staff Sergeant in the U.S. Army Air Force. In February, 1493 he dropped his lucrative baseball contract to enlist. Despite never making his way to the front lines, DiMaggio did offer a morale boost for the troops, playing on various military baseball teams. Bob Feller was the first active major league baseball player to enlist in the military. He volunteered just two days after the bombing of Pearl Harbor. Feller missed nearly four seasons serving in the Navy from 1942 to 1945. He was a Chief Petty Officer on the U.S.S. Alabama, stationed in the South Pacific. All-time baseball great, Hank Greenberg, is one of the greatest athletes in the military. He registered in October, 1940 as one of the first in a peacetime draft. A little more than a year later he reached the rank of Sergeant. After Congress released men over the age of 28 in December, 1941, Greenberg re-enlisted on his own accord just a couple of months later. Greenberg helped raise hundreds of millions of dollars in wartime bonds playing baseball. In 1944, Greenberg, now a captain, requested to go overseas and served in Asia. Tim James had a short NBA career, playing for the Heat, Hornets and 76ers, all between 1999 and 2001. Following that, he took his game overseas for five years to play in Japan, Turkey and Israel. In 2008, James enlisted in the military. Within a few months he was deployed to Iraq, serving as a member of an Army task force that specialized in stopping enemy explosives. James was named to the University of Miami Sports Hall of Fame in 2009. After entering the American Football League in 1968 as an eighth round pick, Bob Kalsu went on to become the Buffalo Bills' rookie of the year. After the season, he entered the Army and was sent to Vietnam in November, 1969. Kalsu was killed in action in July, 1970. Christy Mathewson is one of the first professional athletes in the military. Regarded as one of the greatest pitchers of all-time, Mathewson also served in the Army. He enlisted for WWI and served as a Captain for a chemical unit. Mathewson got tuberculosis after accidentally being gassed. Nicknamed "the Admiral" for his service in the Navy, basketball Hall of Famer David Robinson is one of the more prominent recent athletes in the military. After graduating from the Naval Academy, the Navy released Robinson from active duty early. This allowed the center to pursue his NBA career. Robinson stayed on in the reserves, often acting as the spokesperson on recruiting materials. As the first black player in the majors, Jackie Robinson was subject to lots prejudice on and off the field. It was a similar case for Robinson in the military. After being drafted in 1942, Robinson was designated to a segregated unit. It was only after public protests that he and other black soldiers were admitted to the desegregated unit they qualified for. Later, while boarding an Army-commissioned bus, Robinson was asked to move to the back. He came under scrutiny for refusing to do so. Despite that he didn't drink, Robinson was brought up on presumably bogus public drunkenness charges. Because of the court martial, he was never deployed overseas. Robinson's story is one of the more controversial featuring athletes in the military. Of all the notable athletes in the military, none have a more tragic story than Pat Tillman. Following the 9/11 attacks, the Arizona Cardinals safety walked away from the NFL to enlist in the Army. He served several tours in Afghanistan before being killed by friendly fire in 2004. Tillman's story was recently told in the critically acclaimed documentary, The Tillman Story. One of baseball's greatest hitters, Ted Williams is also one of the most famous athletes in the military. 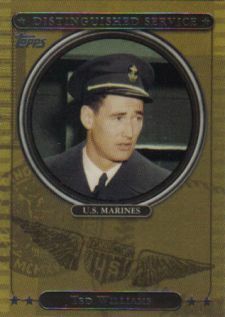 Williams entered the U.S. Marine Corps following the 1942 baseball season. Trained as an aviator, Williams also continued to play baseball, often on military all-star squads. Williams received his honorable discharge in January, 1946. Some other notable athletes in the military include Rocky Bleier, Jerry Coleman, Jack Dempsey, Bobby Jones, Joe Louis, Jack Lummus, Stan Musial, Warren Spahn, Roger Staubach and Hoyt Wilhelm. You forgot to mention the 2008 Topps/Topps Chrome Football Honor Roll insert set.There were also a military patches, armed forces fans of the game and mini medal subset from this product. No Good Card Shops in New Orleans (ID 29764) � Ah yes. Thanks for the reminder. I was a big fan of the Distinguished Service set. In fact I pulled a Stan Musial and learned that he had actually been stationed in my hometown of Port Deposit and played for the Bainbridge Baseball team. I did a lot of digging on Stans military career and had my findings published in Cecil Soil the magazine for the county in which Port Deposit resides. Great to see others appreciated this sub set as much as I did. Keep in mind Ted Williams would have been the all time HR leader had he not missed the prime of his career in WWII and Korea. He flew over 40 combat missions in Korea.